Adrian Catch is an exceptional family entertainer with over 20 years experience at home and abroad. With a variety of exciting skills, his attention to details in all his performances ensures everyone has bundles of fun! The kids try their hand at many of the circus tricks that can only be seen ringside. Join in the 'Big Top Fun' at Catch's Magical Circus. Learn how to spin Plates, Throw a Diablo, Juggle 3,4 or maybe 5 Objects, Balance on the Rolla Bolla, Whizz around on the Pedal Go's, Walk Tall on Stilts or even Master the Art of Riding the Unicycle. These skills and many more all help to make up a 'Fun Day' out at Catch's Circus Theme Party. As 'Catch the Clown' Adrian demonstrates each of the exciting circus skills. He is then on hand throughout the Circus Theme Party to help the children in the amazing 'World of the Big Top'. As the kids get to grips with their new circus skills the emphasis is on Fun and Enjoyment so they leave the party with a new found confidence and a happy 'smiley' clown face. 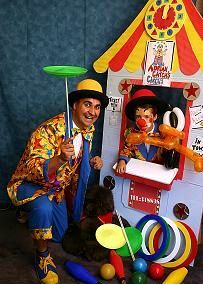 The parties are structured to fit each individual occasion making them ideal for Children's Birthday Parties or Circus Workshops with easy to play Big Top Games incorporating the circus equipment. So whether you are having a Children's Birthday Party or planning circus skills as part of an educational programme you will find Catch's 'Circus Theme Parties' a 'Big Top' Winner with the Kid's. 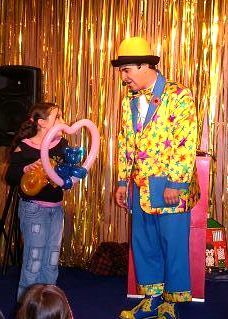 For exciting fun filled MAGIC CHILDRENS PARTIES with lots of audience participation and interaction. Playing for laughs and cheers the children are left baffled and amazed by the fun magic tricks Adrian performs. The magic routines are especially devised to stimulate the young audiences minds. With at least one 'little' lucky volunteer invited to dress up and be the Magicians assistant. 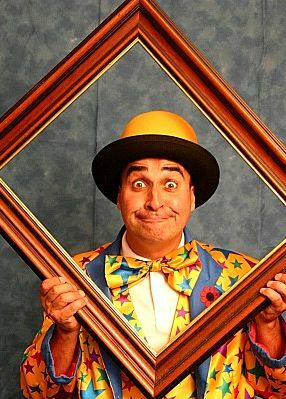 'Catch' the Clown, Adrian has performed his magic show in many family venues around the UK.